The end is near. It’s got to be. If it isn’t, then why is the Pope on television kicking off a weeklong, worldwide marathon reading of the Bible? And why is Sarah Palin actually being taken seriously as a vice presidential candidate? I say expect the pale rider on the pale horse any minute now. Am I the only one who just noticed that Sarah Palin’s surname is PALE-in? Come to think of it, am I the only one who just realized that John McCain is so pale and white-haired that he could pass for Johnny and Edgar Winter’s uncle? Pope Benedict XVI’s “”In the beginning” started off a weeklong Bible-reading marathon on Italian television Sunday. RAI state TV began its program called “”The Bible Day and Night,” with Benedict reciting the first chapter of the book of Genesis … the holy text’s opening verses about the creation of the world…The marathon will feature more than 1,200 people reading the Old and New Testament in over seven days and six nights…The Bible marathon is scheduled to end Oct. 5, when Cardinal Tarcisio Bertone, the Vatican’s No. 2 official, will read the last chapter of the Apocalypse. Like most people, my favorite part of the Book of Revelations is a toss-up between the part about the mark of the beast and the part about the great whore of Babylon. But my next-favorite part is where the seventh seal is opened to reveal that the two beasts are…well, let’s just get right to the point and note that an email I’ve received SEVERAL times in the last few months says careful reading of the Bible proves that Barack Obama is the anti-Christ and that the end times are at hand, and now we’ve got the second-ranking official at the Vatican reading about the Apocalypse in a nationwide TV broadcast and a second-rate second-ranking member of the GOP presidential ticket who believes that Alaska will be the refuge for all the true-believin’ Joe Six Packs and hockey moms when the Rapture comes, that Earth was created 6,000 years ago and that the Apocalypse will start in that gosh-darned Middle East. “Drill, baby, drill?” Well, of course. It all makes sense now. If we don’t have good, old-fashioned American oil and natural gas, doggone it, then how the heck will we keep hell’s fires burning? Mr DiGiovanni, re Pale horse, pale rider, Palin: quite humorous piece – may you not run out of gas nor oil to keep your homefires burning. I just would like to comment on one aspect of your little satire, (for the Pope inspired me to read the whole first page of the Bible! ): “in the beginning God created the heaven and the earth”…I cannot find where the author says 6000 years ago. Really, you just read it yourself – it just says God created it…Bang! fullstop! Perhaps somewhere else in the Bible, I don’t know. Instead, I find that he then leaves it there and turns to the condition of the earth as it was then, a condition that remarkably corresponds with the theories hold by the scientists. As to creating all these awsome things in just 6 days, each 24 hours long? I simply do not believe that. Mr DiGiovanni, I wish the Pope would sit there in public and read just the first page of the Bible, over and over again… I greatly admire the Pope, please dont get me wrong, but it’s just that I suddenly can’t get away from this first fascinating page of the Bible. Perhaps this ‘misinformed’ generation will start reading, seeing,thinking…for themselves? I’d be happy if he read Genesis one, then Genesis two and explain the differences? Is there some alternate universe Earth? Is man just Gods little gardeners? Was woman made from dirt, or a rib? Which sequence of creation is correct? If Eve was made from a rib- wouldnt she be a genetic twin, Adams biological sister? And thats just Genisis… then explain the ‘fixed Earth’…etc, etc. 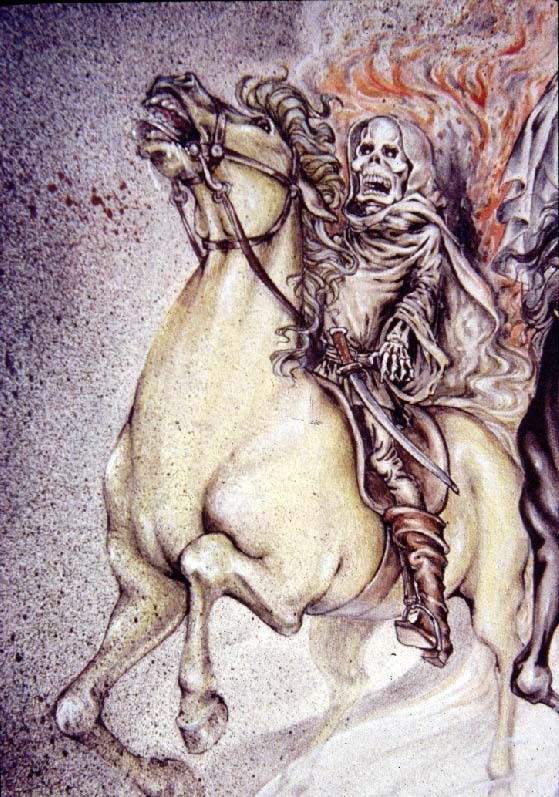 Let’s just hope and pray that the times do not get so bad that a Rider on a Pale Horse is elected president and commences to burn all the books save one — The Bible! !